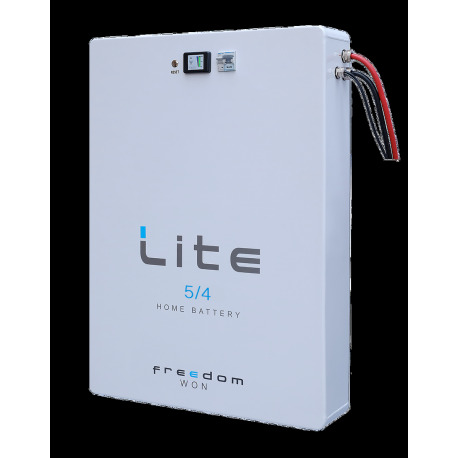 Buy your Freedom Lite 5/4 battery at the best price online.This battery has a 13 year lifetime, with more than 3 500 cycles. This is with an average of 250 to 350 cycles per year. In addition, Freedom Lite 5/4 batteries have a discharge rate of up to 85%. Which gives you a far greater storage capacity than lead batteries. By connecting the lithium batteries to the Solax inverter you can check discharging and charging of these batteries on-line free of charge. Lithium Battery: The Freedom Lite 5/4-48V is a lithium battery. The particular advantage compared to lead batteries is that the charging/discharging cycle is more efficient. Moreover, the materials used are less hazardous to the environment. The Freedom Lite has an integrated BMS (battery management system) which optimizes its operation and protects it against current surges.The large screen allows you to track the performance of the battery. 35 mm2 of battery cables are included. Estimated life of 13 to 20 years: we estimate the 5/4 Freedom lithium battery has a lifespan of about 13 to 20 years, depending on the discharge rate chosen (from 50 to 70%). Lithium technology means the life span will be 60% longer than that of lead batteries. Your system's performance is covered for the coming years. Total number of cycles: between 3 500 and 7 000: the Freedom Lithium battery makes it easy to increase the number of cycles compared to lead batteries. The minimum guarantees for Freedom is 3500 cycles. The expected lifetime is 4 800-7000 cycles, depending on the rate of discharge chosen (70-50%). However, you can opt for a maximum charge rate of 85%. 5 000 Wh battery life: This 5 000 Wh battery will easily meet your household needs. This is equivalent to 5 000 W for a period of 1 hour. If this is not enough autonomy, you can add more batteries to your cart. The capacity is simply added on. 6 000 W output power: The Freedom Lite 5/4 has a maximum 6 000 W instantaneous output. 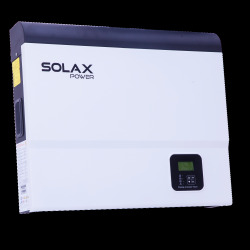 48 V operating voltage: The Freedom Lite operates at 48 V, which means the battery can easily act with the majority of inverters which also have a voltage of 48 V.